From Route 124 turn onto Dublin Road. 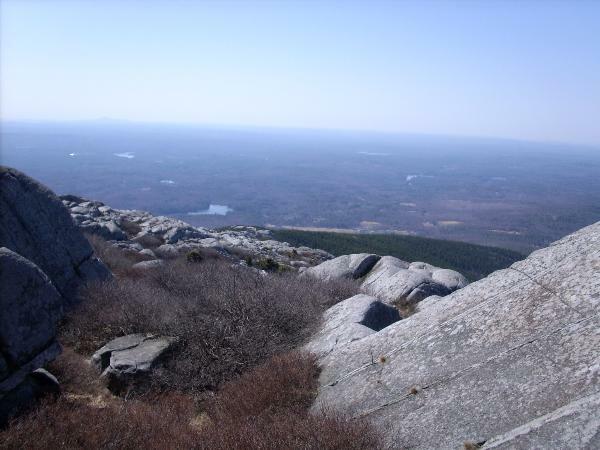 Follow Dublin Rd 1.1 miles to Poole Road and signs marking Monadnock State Park on the left. A large parking lot is available 0.7 miles at the end of Poole Rd. Currently a $4.00 Fee applies to enter the State Park. 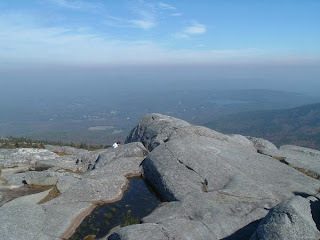 DESCRIPTION: The White Dot Trail is the shortest and most direct route to the Monadnock summit however the terrain is steep over open exposed ledges, boulders and may not be the best option for children. The White Dot trail starts by entering the woods to the left of the State Park Visitor Center and ascends very gradually. After 0.6 miles you will reach the White Cross Trail junction to the left (See description below). The White Dot continues it's gradual ascent another 0.2 miles to the Cascade Link junction exiting left. From here the trail ascends steeply over exposed ledge and rocky terrain. Look for the small wooden "1/2 WAY" sign on a tree to the right of the trail. After the steep section the trail becomes more gradual through a hardwood forest to the Old Ski Path trail junction at 1.2 miles. As elevation increases hardwood trees mix with spruce then the trail begins to incline up a steep section of bare rock known as "The Chute" soon reaching a open plateau where views to the West are spectacular. You can see Pack Monadnock and peaks along the Wapack Trail as well as the Monadnock summit looming before you. The White Dot Trail continues over bare rock and dipping through spruce trees as it ascends. Watch for cairns and white dots painted on the open ledges as the White Dot Trail joins the White Cross Trail at 1.6 miles. The final 0.3 mile push climbs steeply over exposed slabs of granite to the summit. Look for a benchmark disk and drill hole marking the obvious summit. The White Cross Trail begins by following the White Dot Trail 0.6 miles past the State Park Visitor Center. The White Cross Trail ascends over easy to moderate grades the first 0.3 mile then ascends moderately steeply through a birch glade. The trail is more stair step-like and less technical than it's White Dot counterpart making it an easier ascent on your leg muscles.. You'll reach the White Dot trail junction at 1.7 miles. 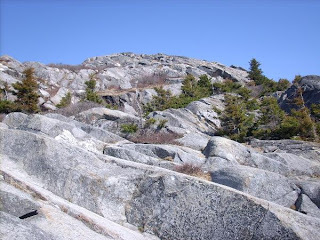 The final 0.3 mile push climbs steeply over exposed slabs of granite to the summit. Look for a benchmark disk and drill hole marking the obvious summit. NOTES / COMMENTS: Monadnock is considered the most hiked mountain in the USA and extremely rewarding with panoramic views from it's open summit ledges. 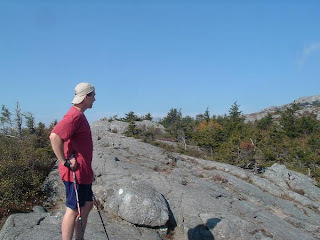 If you are looking for isolation then I'd suggest a different mountain but if you are looking for a quality hike with rewarding views (and don't mind the company of strangers) then attempt this hike.